For botanical artists like Jacqui Pestell, what used to be reproducing precise details of plants for scientific and academic study has developed into an actual form of art called botanical painting. “Botanical illustrations are published in scientific journals, whereas botanical paintings are what people will hang in their houses,” said Pestell who is course director in Botanical illustration at the Royal Botanic Garden of Edinburgh (RBGE). Pestell and five other artists from RGBE recently exhibited their work at Lalitpur’s Park Gallery. 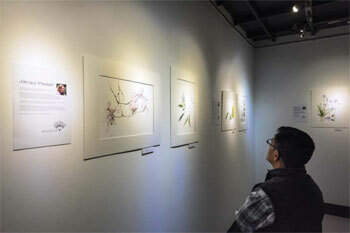 The three-day exposition also displayed works from Park Gallery’s director, Neera Joshi. “These fourteen paintings demonstrate the different contemporary styles of botanical art,” said Pestell. Joshi, who studied at RBGE added that sometimes, a creative eye is needed as artists can see details that scientists cannot. “Even though these paintings have to reproduce precisely the physical characteristics of plants, each botanical artist has his or her own style,” she said. The exhibition at Park Gallery is also part of a project marking the celebrations for the Bicentenary of British and Nepali diplomatic relations that will take place in 2016. RBGE artists will highlight the even longer connection that has existed between the two countries as Scottish botanist, Francis Hamilton, made the first ever survey of plants in Kathmandu Valley back in 1801. “Our mission is to walk in the footsteps of Dr Hamilton, who was known as ‘the Father of Nepali Botany’,” Pestell told Nepali Times. In their research field trips in Kathmandu Valley, RBGE artists will be accompanied by botanical expert, Sangeeta Rajbhandary of Tribhuvan University. “We will focus on ethnobotany and collect information about Nepali flora to create new artworks that will be exhibited at RBGE in July 2016,” said Pestell. Besides their field research, Pestell with other RBGE artists, Işık Güner, Lyn Campbell and Sharon Tingey will be sharing their knowledge of botanical art through a series of workshops at the Kathmandu Contemporary Arts Centre (KCAC) next week. Even though Joshi runs workshops on botanical art at Park Gallery, she admits the art form has yet to gain popularity in Nepal. Unlike Nepal, botanical art has gained immense popularity in Great Britain over the past 20 years, according to Lyn Campbell. “I think it’s because people are now more aware of the importance of protecting their natural heritage,” said Pestell. Despite the increasing use of digital technologies in publication, RBGE artists said no one does botanical by drawing solely on a computer. Kashish Das Shrestha recently visited the Nepali peacekeepers in Haiti, and here chronicles fragments of a soldier's life, far from home.